How is it already mid-February? My 2017 started off with me getting what I thought was a really bad cold, but in hindsight it was probably the flu from hell that seemed to be everywhere in Washington. I recovered (mostly) in time for my trip to Yellowstone with Jared Lloyd (I went on the wild horses workshop with him last spring), and co-led by Doug Gardner. They’re both fabulous and if you’re looking for a wildlife workshop I can’t recommend them enough. They’re excellent photographers as many photog workshop leaders are, but they’re also excellent teachers—which some photog workshop leaders are not. For my fellow writers, it’s similar to how just because a person can write well doesn’t mean they’re automatically a good editor. I haven’t managed to get through all of the photos I took (a few thousand…), but I have a few to share. Yellowstone in the winter is so fun and pretty! And cold, imagine that. 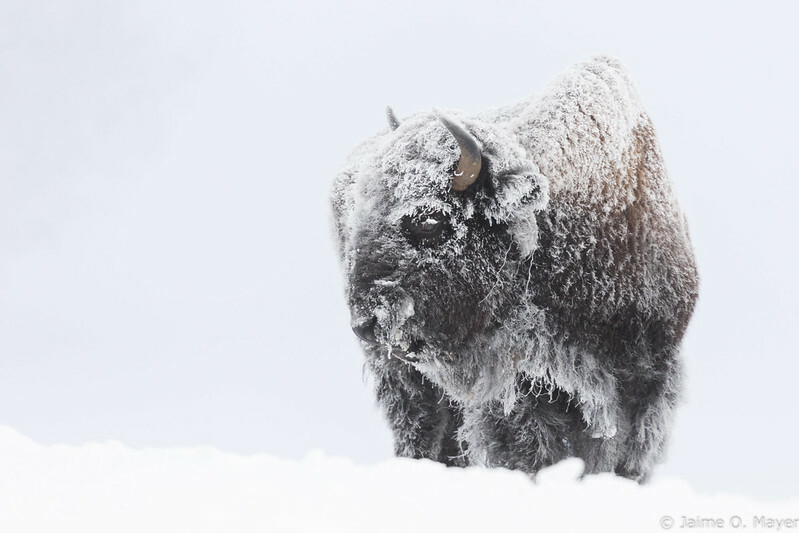 I’d never been to Yellowstone before, or in negative degree temperatures, so I wasn’t entirely sure what to expect. Since my only frame of reference for “cold” was the 16-17 degrees Fahrenheit I’d experienced during undergrad out in eastern Washington, let’s just say that -20, -25F on our first morning in the interior was eye-opening. Actually, icicle-on-eyelash-inducing.Photo courtesy of Jared Lloyd Photography. Also, don’t be the person who forgets her snow pants in the hotel on the first morning. Frolicking around in Polartec 200-weight pants when it’s -20F out is a poor life decision. I’m compiling an album that you can find on flickr, and will eventually get one up on facebook. 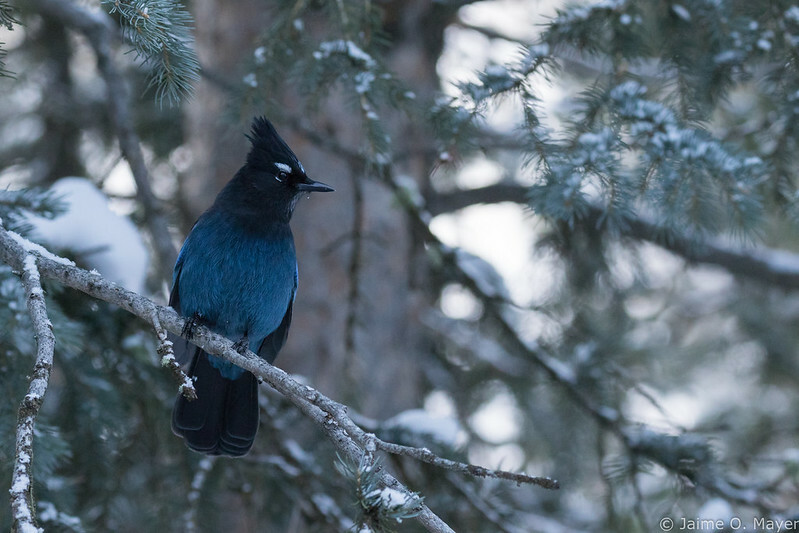 We saw plenty of wildlife despite the heavy snow in the interior. Bison are everywhere, which can actually make it challenging to get an interesting photo of them. 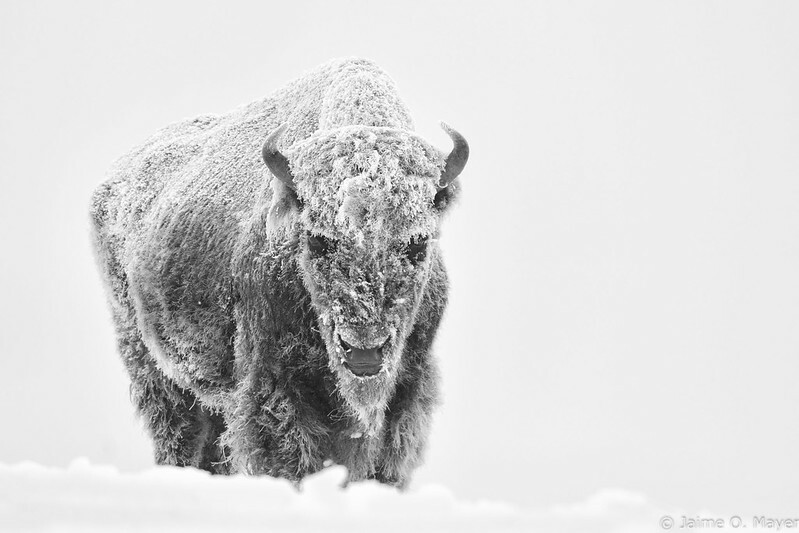 The first morning where it was super cold was pretty lucky for us, because you need the temps to get down that low or lower in order to get images where the bison are covered in hoarfrost. Which was the kind of shot at the top of my list to try and get. Pretty happy with it. Bison don’t quite have the “look of eagles” that horses possess, but they make a good go of it. We were also really lucky to see a long-tail weasel in its winter phase coloration. 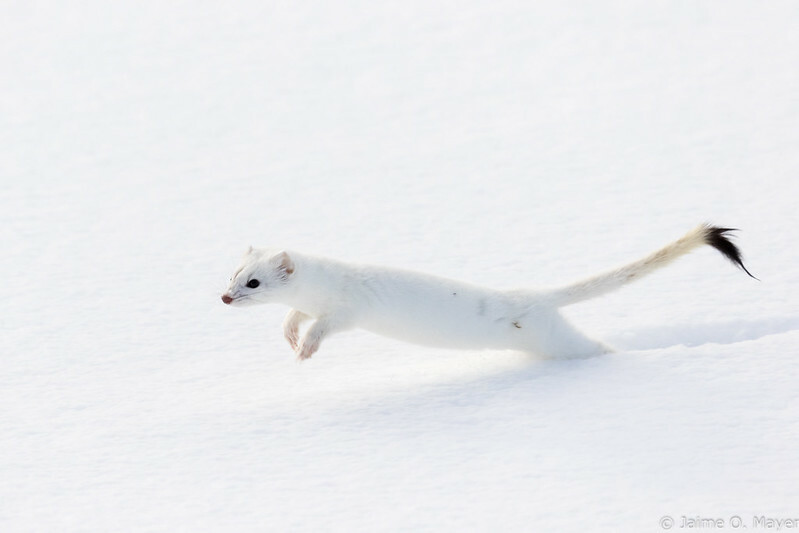 Apparently only the short tail weasel gets to be called an ermine when it turns white. Photographing this guy was an exercise in frustration because he was so fast, small, fast, white on white, did I mention ridiculously fast? For legs that are only a few inches long these things can fly across the snow. We were fortunate to get about 20+ minutes with him as he hunted for rodents sleeping under the snow. Others that I don’t all have up yet are foxes, river otters, coyotes, bald eagles and a bunch of other birds, bull elk, bull and cow moose, mule deer, bighorn rams…and I’m probably forgetting some others. On the writing front, draft zero of the novel is nearly done. If all goes according to the outline (ha! ), then there’s three chapters left. I was able to get into session 3 for Rainforest Writers in early March, so the plan is to have the draft done and start typing it up (2/3 of it have been handwritten because I’m weird like that) at Rainforest. We’ll see how that goes. I’ve never been to the Rainforest retreat/workshop before, or Lake Quinault, and I’m looking forward to both the writing and photographic opportunities.